It was perfection last year for the football team, going 8-0 en route to their second-ever NESCAC title. The program — which had never won a conference championship before 2009 — has transformed under the leadership of Coach E.J. Mills. With two perfect seasons in the last three years, the Lord Jeffs have risen to the top of the NESCAC, going 22-2 in their last three seasons. But with that success comes expectation. The team has lost a number of veterans from last year and will have to see younger players step up to fill the void. The Jeffs have the talent to compete and will be attempting to successfully defend their NESCAC title for the first time in the program’s history. Success, though, certainly will not be easy. The team faces a number of obstacles, the most concerning of which is undoubtedly their youth. The program graduated 18 seniors last year, who made up the most successful class in Amherst history. Over their four years, the Class of 2012 went 27-5, including two perfect seasons and NESCAC Championships. 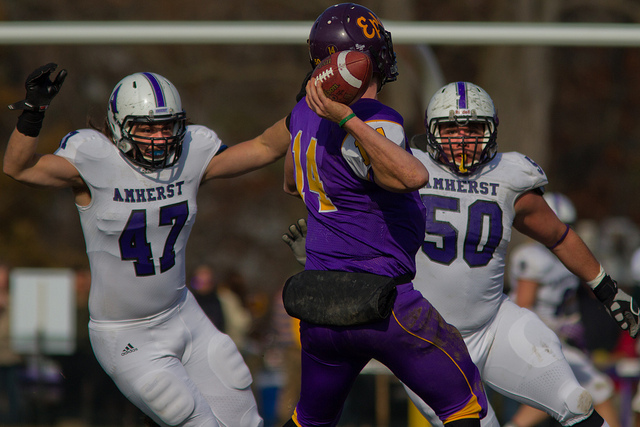 Of those graduates, Amherst will face the biggest void at the quarterback and running back positions, where Brian McMahon and Eric Bunker, respectively, proved to be two of the best in the conference. Last year, Bunker set the record for the most touchdowns in a season, barreling into the end zone an impressive 12 times in eight games. Not to be forgotten, kicker Matt Rawson was also instrumental to the program’s success. The best kicker in Amherst history, Rawson set records for single-season points-after-touchdowns, career scoring and career field goals. Of course, the Jeffs return many key players as well. John Ceccio ’13 has anchored one of the best offensive lines in the NESCAC for three years, paving the way for a fast-paced offense and potent running game. Ceccio is a two-time All-NESCAC First Team selection and has already been named to the 2012 Preseason All-America team. It remains to be seen who starts at running back but a strong line will surely allow Amherst to build upon last year’s ground game, which ranked second in both yards per game and total touchdowns. On the other side of the ball, three rising seniors will anchor the defensive line. Middle linebackers Sam Clark and Matt Pieterse form a tough tandem at the line of scrimmage. The two combined for 140 tackles last season and will hope to replicate that success this year. Bolstering the secondary, Landrus Lewis will look to build on his most successful collegiate season. Named to the All-NESCAC First Team last year, Lewis made his mark as one of the best defensive backs in the NESCAC. Lewis also led the NESCAC in yards per return (13.2) as the Jeffs’ return specialist. Behind these stalwarts, Amherst will hope to lock down on defense and take some pressure off of the offense. In fact, that defensive success may be even more important this season with many key offensive roles in flux. Most conspicuously, the team has a big gap to fill at quarterback. This, though, is not new territory for the Jeffs. Just last year, McMahon was injured in the preseason and was held out of Amherst’s first four games, but backup Blake Grauer ’12 stepped up and delivered four wins. It was a testament to the team’s depth, and Amherst will surely rely on the same talent this year to make up for the lack of experience. This year, sophomore Max Lippe and junior D.J. Petropulos appear to be the preseason favorites to take over the starting QB job, though neither has had much exposure to the collegiate game. Petropulos has taken only six snaps in two games — though his completion rate is 100 percent — while Lippe saw no action as a first-year. It remains to be seen how this team will take shape, but with strong young talent and the leadership of Mills, this team has certainly the potential to put together another impressive season. Much of this, of course, will remain speculation until the regular season begins on Sept. 22. The Jeffs’ start their 2012 campaign by playing host to Hamilton, but then face a tough stretch on the road against Bowdoin and Middlebury. Two perennially strong programs, the Polar Bears and Panthers will be important road tests for the Jeffs to see what this team is capable of. Amherst also faces a grueling finish to the season, playing away at Trinity before closing out the season at Homecoming against Williams. Trinity has not lost at their home field since 2001 and has won 15 of the last 23 matchups against the Jeffs. Williams, who beat the Jeffs at Pratt Field the last time they visited in 2010, will also not be a cakewalk. With renovations starting on Pratt Field after the season, the Jeffs will try to end their successful run on Pratt Field with a win. Despite a tough schedule, the Jeffs seem up for the challenge. Over the past three years this core group of seniors has proven to be the best in the NESCAC and will carry that momentum into this season. With so many new faces and some big shoes to fill, the team certainly has a lot of questions to answer, but above all else that makes them a must-watch. The defending champions are not a lock to win it all again. But that certainly does not mean we should count them out.